A recipe from Monique van der Vloed containing, among other things, Greensweet liquid stevia Coconut. Let the pot of coconut oil in a container of hot water melt into liquid oil. Stir about 100 ml of water and about 10 drops of Greensweet liquid stevia Coconut through the coconut grater and let stand for a while. Cover a plate with baking paper. Squeeze out a little coconut grater and carefully place these little holes on the plate. Stir about half a coffee cup of cocoa powder through 200 ml of coconut oil, drop about 10-15 drops of Greensweet liquid stevia coconut and stir. Wait until the oil solidifies again. 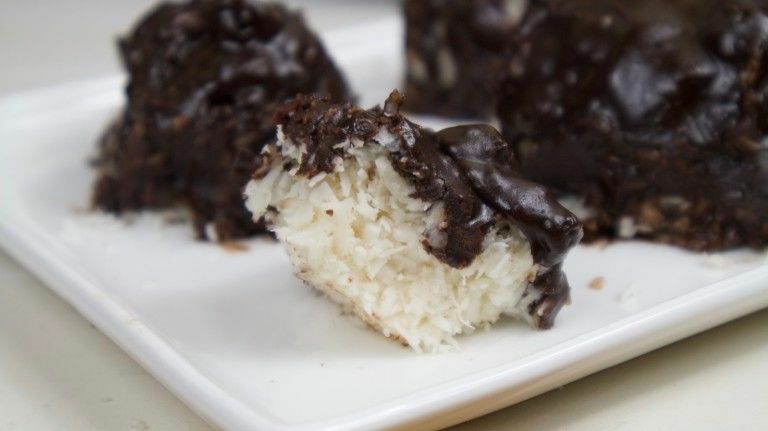 As soon as the chocolate has solidified again, pour it over the coconut groats on the plate. Let this dry for some time. You can best keep the rocks on a scale at a room temperature of 16 degrees. They are also very tasty from the freezer! Freeze them 24 hours before consumption. Also keep cold in the refrigerator for cool rocks. These are nice on warmer days.